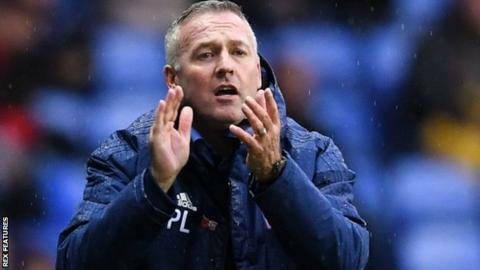 Ipswich Town boss Paul Lambert believes his squad have already shown the character needed to lift themselves out of the Championship relegation zone. Bottom-placed Ipswich host West Bromwich Albion on Friday, looking for just their second win of the season. Lambert, 49, has overseen two draws after taking charge in October following Paul Hurst's sacking. "You can never predict results, but I can tell you the players are giving everything," Lambert said. Ipswich are five points adrift at the bottom, but former Norwich City, Aston Villa and Stoke City manager Lambert thinks the deficit can be made up quickly. "It's nothing really," he told BBC Radio Suffolk. "We can make that up in the space of two games if results go our way. "But we have to start winning. We're playing well enough and our performances so far have deserved more." Lambert has named the same starting XI and substitutes bench in his two games in charge, but says new recruits are planned for January. "It's well-documented that we need a little bit of help," he said. "But sometimes the best recruitment is not to bring anyone in at all as it upsets the apple cart. "I'll only bring players in if it's right for the club, they're the right characters and they want to be here. "We're unbalanced in certain areas and there's not the cover and depth in certain places if we get injuries and suspensions." Following Friday's fixture against West Brom, Ipswich have a packed schedule which sees them play seven league matches in four weeks before the January transfer window opens. "I'm trying to get [Andres] Iniesta back from China, but I might need a little help from [owner] Marcus Evans on that one," Lambert joked. "Marcus has been brilliant since I've been here, but it's up to us to get the place going both on and off the pitch." Which managers took charge of rival teams? Read more on Paul Lambert: Can you name the other managers to take charge of rival teams?